After sharing the BBC Sherlock with a coworker, we had a conversation about the amazing writing and actors. Somehow that led to us talking about The Dark Knight series. Everyone knows Warner Bros. will definitely be continuing the series because they love money, and everyone loves Batman. Well, we came to the conclusion that, while many would go with the already over-used Benedict Cumberbatch, we would suggest Andrew Scott for the next Batman series' Edward Nigma- otherwise known as The Riddler. He would be such a wonderful Riddler. If somehow, Christopher Nolan reads this, pass word along and make this happen. I spent all of 10 minutes making this simple mock up pic just because. Enjoy, and let me know what you think of our casting choice. 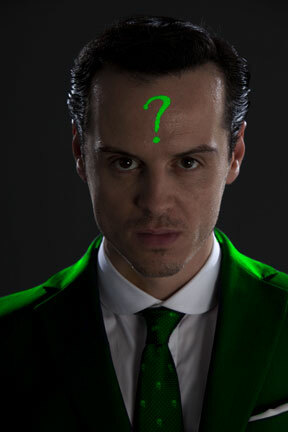 I refuse to watch ANY Batman movies unless Andrew Scott is the Riddler!